February! When the excitement of January’s healthy eating resolutions starts to fizzle and the long, cold winter days leave us craving warm, hearty, comfort foods. What a combo! Don’t despair! Canadian Turkey and I are here to re-inspire you with 10 deliciously nourishing recipes to satisfy your cravings for comfort food and help you stick to your healthy eating goals. Spanish Style Braised Turkey Thighs with Artichokes and Olives. Just reading the name of this recipe makes my taste buds tingle! Braising the lean turkey thighs develops a rich flavour without sacrificing healthfulness. For a lighter version, remove the turkey skin before eating (but leave it on to cook), use poultry broth in place of the wine, and reduce the amount of olives by half. I recommend serving this with whole grain brown rice and roasted cauliflower drizzled with lemon. Turkey Sliders with Chipotle Mayo and Avocado Relish. Dreaming of sunny summer days and dinners on the patio with a barbequed burger? Don’t wait for warmer weather! Fire up the barbecue and bring a little summer into your day NOW with these barbequed turkey sliders. These sliders are an economical way to feed a crowd and are fantastic for your Family Day festivities. Turkey Taco Pizza. Pizza and tacos are my kids’ favourite comfort foods, but let’s face it, these aren’t always the most nutritious choices. And that’s why I love this turkey taco pizza: it balances my kids’ desire for pizza and tacos and my desire to make sure we’re all eating well. It’s made with lean ground turkey, which is miles above pepperoni in terms of nutritional value. It also uses homemade taco mix, which is less salty than packaged mixes. Serve it with a big plate of fresh cut veggies and extra salsa for dipping. Big Batch It: Double the ground turkey and taco mix. Once it’s cooked, refrigerate or freeze half for another meal. It makes great turkey taco quesadillas or salads. Warm Turkey and Root Vegetable Salad with Goat Cheese Dressing. If you think salad is too simple or boring to be comfort food, this warm root veggie and turkey salad will definitely cause you to change your mind! The intense flavours will crush any comfort food cravings! Nutritionally speaking, it’s jam-packed with super foods including nutrient-rich turkey, beets, brussels sprouts, carrots, turnip, sweet potato, arugula and walnuts.. It’s a 10+ in this dietitian’s books! Taste of Tuscany. Is there anything better to love than a slow cooker that basically makes your meal while you go about your busy day? Now, imagine how dreamy your kitchen will smell while this garlicky Taste of Tuscany soup simmers in your slow cooker. This dish features fibre-filled pulses (white beans) that help to keep you feeling satisfied along with the protein from the turkey sausage. That’s important to help you manage your appetite. I would serve this saucy dish with a dark leafy green salad on the side. Indian Turkey with Chickpeas and Spinach. Crave curry? You’ll love this recipe that is part soup, part stew, and all scrumptious! In this bright, flavourful dish, the boneless turkey thighs pair perfectly with the fresh, authentic Indian flavours of ginger, coriander, curry, and red pepper flakes. It’s also made with just 1 tablespoon each of butter and oil, making it a healthier comfort food compared to some traditional creamy curry dishes. Leftovers make a terrific packed lunch! Sweet Potato Shepherd’s Pie. You’ll want to add this lightened up version of the classic comfort food to your weekly meal plan! Here’s the twist: it’s made with leftover turkey and a mashed sweet potato topping. To make the sweet potato topping you use buttermilk to keep it light – although its name might suggest it’s rich in calories and fat, buttermilk is actually only 1% milk fat. It’s a great make-ahead meal that you can freeze for another time. Cook Once, Eat Twice: On the weekend, roast a whole turkey, an extra large turkey breast or extra thighs to enjoy for Sunday dinner and plan to keep the extras to make this hearty dish! Turkey Skillet Lasagna. You need this lasagna in your life! Not only is this dish lighter than traditional recipes thanks to the lean ground turkey, lack of béchamel, and a little less cheese, but it’s also a marvelous meal made in just ONE pot. And you know what that means? Less clean up for you! Oh yeah! Moroccan Turkey & Vegetable Pot Pie. Traditionally, pot pies are filled with a creamy sauce and topped with biscuits. It’s an indulgent comfort food to enjoy now and then, but THIS pot pie fits in the category of “anytime comfort food”! It’s made with extra-lean ground turkey, a good amount of veggies (definitely add the peas, maybe even more! ), and a really unique phyllo pastry topping instead of biscuits. You’ve got to try it. Garlic Herb Roasted Turkey with Light Sauce. Roast turkey is the ultimate good-for-you comfort food; it combines a whole lot of nutritional value with feel-good memories from holidays and family times. But wait! 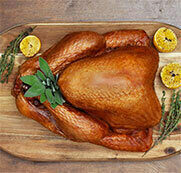 Whole turkeys are not just for special occasions. A roast turkey is comfort food fit for any time of the year! Go for nutrient-rich side dishes like barley pilaf, sautéed greens, and roasted sweet potato.